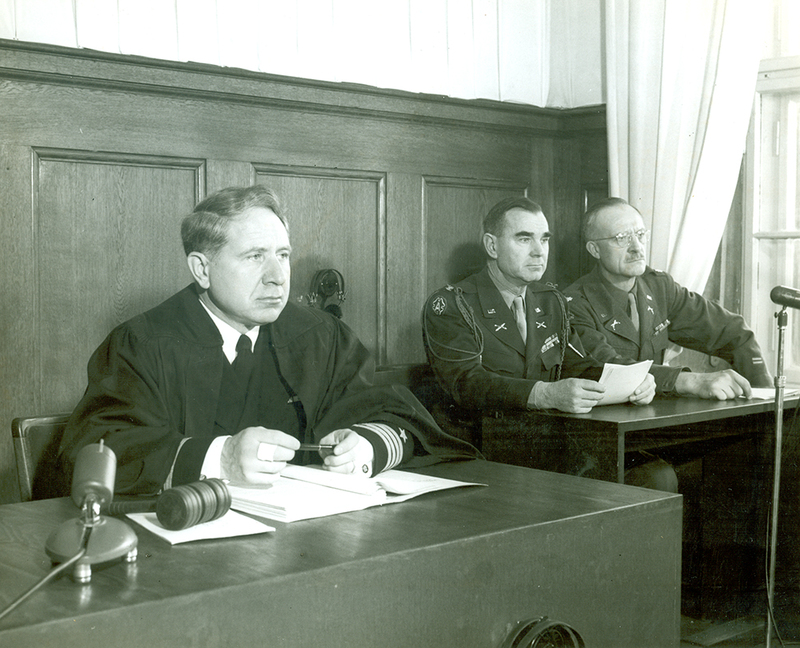 Judge Musmanno at Nuremberg, 1947. Duquesne University Archives and Special Collections. Between 1946 and 1949, the U.S. military conducted the “Subsequent Nuremberg Trials,” prosecuting mid-level Nazi officials who carried out war crimes and implemented Nazi policies in Nuremberg, Germany. It is estimated that from 1941 to 1943, the Einsatzgruppen, or Action Groups, had murdered more than a million Jews, Gypsies, and other political enemies in a series of massacres throughout Nazi-occupied Europe. Their fate would now be decided by a tribunal of American judges with military backgrounds, all appointed by President Truman. Presiding in one such trial was prominent Pittsburgh judge Michael Musmanno. Born in 1897 to a working class family of Italian immigrants in Stowe Township, Musmanno worked in mines and in the steel industry to pay for college. He earned multiple degrees but returned to Pittsburgh to practice law. Musmanno became a crusader for labor rights and the public good. Before the Nuremberg trials he joined the appeals team in the case of convicted Italian anarchists Sacco and Vanzetti and he also defended the rights of Pennsylvania coal miners. When the U.S. entered World War II, Musmanno (who was exempt from service as a judge) sought a commission in the Navy. 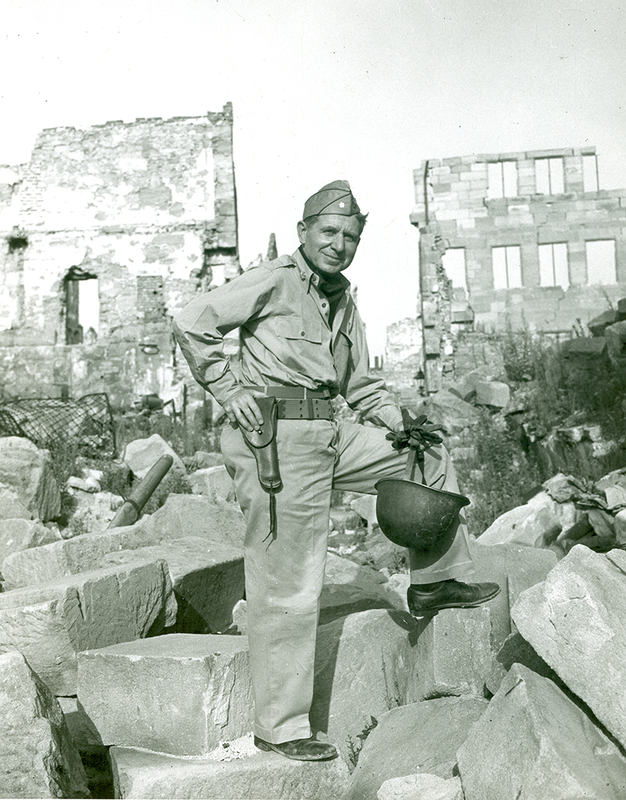 Musmanno stands atop rubble during his time as military governor of the Sorrentine Peninsula, 1944. Duquesne University Archives and Special Collections. At the Einsatzgruppen Trial, from September 1947 until April 1948, Musmanno and associate judges listened to the testimony of the men who had committed the atrocities. The defendants repeatedly claimed they were simply following orders. One soldier, Otto Ohlendorf, declared that he would have shot his own sister if he had been given the order from Hitler. Before the war such an argument might have served as a shield, but the war crimes of the Nazis were on too large a scale and too well documented for such detachment. Musmanno later wrote that Ohlendorf and many of the other defendants never showed any remorse and instead displayed cynicism and a sense of self-righteousness. All the members of the Einsatzgruppen were found guilty. Musmanno had been opposed to the death penalty but he decided that a statement had to be made at Nuremberg because of the scope and brutal nature of these war crimes. Thirteen of the officers, including Ohlendorf, were sentenced to death by hanging; the rest received lengthy prison terms. The Nuremberg trials were an important step toward the establishment of a permanent international court and the development of international criminal law. Musmanno’s passion for the law and commitment to justice made him an ideal judge to participate in bringing these war criminals to justice. Read the full article on Judge Musmanno by Thomas White in the Spring 2015 issue of Western Pennsylvania History. Liz Simpson is the assistant editor for Western Pennsylvania History Magazine and collections assistant with the museum division at the Heinz History Center.